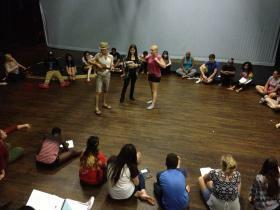 The students and teaching artists of Youth Creates at 7 Stages Theatre, gathering at the end of the day. For 13 years, 7 Stages Theatre has worked to bring young people into the theater through a program called Youth Creates–an intensive five-week production during which students create a show from scratch. WABE’s Myke Johns paid them a visit to speak with the students, interns and teaching artists involved. Youth Creates’ show, Lost Creations, is in performance Friday and Saturday, July 25 & 26. For more, visit Atlanta PlanIt.